Infratentorial tumor surgeries pose unique challenges to both surgeon and anesthesiologist. The presence of tightly packed vital structures, use of various surgical positions such as sitting and park-bench positions, need for intraoperative neuromonitoring, and complications such as venous air embolism, brain stem injury, and acute obstructive hydrocephalus make these surgeries distinct from most other neurosurgical procedures. 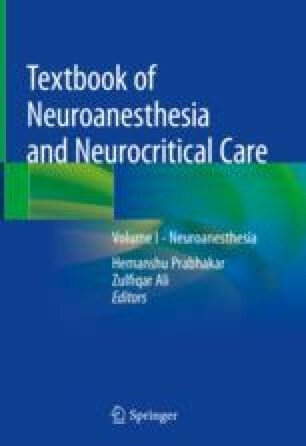 It is essential for the neuroanesthesiologist to have a thorough knowledge of anatomy of posterior fossa, physiological changes associated with various surgical positions, surgical lesions and approaches used to access them, clinical features of these lesions, anesthetic considerations for neuromonitoring and detection, and management of complications. Anesthetic goals primarily revolve around ensuring adequate cerebral perfusion, maintaining cardiorespiratory stability, and management of air embolism. Anesthetic management of these patients commonly involves the use of intravenous anesthetic agents for induction, maintenance of anesthesia using total intravenous anesthesia to enable neuromonitoring, and careful decision regarding extubation or postoperative ventilation. Difference in opinion regarding preoperative echocardiography to detect intracardiac shunt, preference for inhalational or intravenous agents, use of nitrous oxide, and use of positive end expiratory pressure continues to exist. Venous air embolism is a potentially life-threatening complication that has a high incidence in sitting position surgeries. Knowledge of various monitoring devices used for detecting venous air embolism and timely intervention is required to prevent any untoward consequences. This chapter elaborates on each of these considerations and attempts to familiarize the reader with practical aspects of anesthetic management of infratentorial lesion surgeries.